In 2-quart heavy saucepan, heat half-and-half and chocolate over low heat, stirring constantly, until chocolate is melted and mixture is smooth; remove from heat. Stir in liqueur. Pour into fondue pot or chafing dish. Buy precut pineapple in the produce section of your grocery store for an easy addition to the fondue dippers. 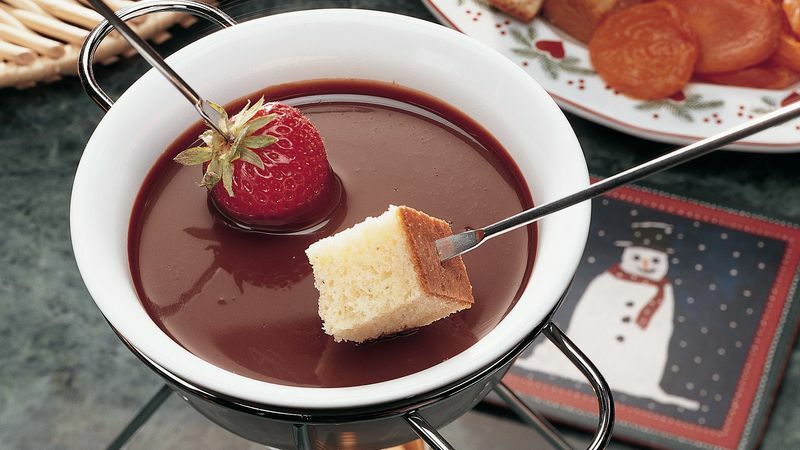 The name fondue comes from the French word "fondre," which means "to melt". Whether cheese, wine or chocolate, fondue tastes great in any language! If dark chocolate is more to your liking, substitute semisweet chocolate chips or sweet baking chocolate for the milk chocolate in this recipe.